Here at the Great Synagogue of Vilna was the epi-center of one of Europe’s most famous rabbis, Elijah Ben Solomon Zalman (1720-1797). He was renowned throughout all European Jewry as the “Gaon of Vilna” called “The Gra” or “the Genius”. His remarkable influence was recognized as the glory of the erudition of Lithuanian Jews for this evolved out of the sphere of the Gaon’s vast knowledge and influence. This knowledge encompassed the scope of all spheres of Jewish science yet his greatest achievement was in editing and his commentations on the Babylonian Talmud plus including the restoration of the Hebrew grammar and geography to Luria’s Jewish Kabbalah. The Vilna Gaon was the first to recognize the epic transition that the future messianic era of the Jewish King Messiah called the Ikveta d’Mechicha literally known as the “heels and the footsteps of the Messiah” had now arrived. After his death, it was his disciples whose mission was to immigrate to Israel, which they did in 1808. This immigration was to have been led by the Vilna Gaon, but with sickness and eventual premature death 1797, his disciples, with the Gaon’s command that they were to continue on to the Holy Land, populated the Land of Israel in preparation for the future revealing of the Era of the Messianic Age. It was concerning this mission that Destination Yisrael published the article in 2010, titled, “The Great Aliyah to Israel by the Disciples of the Vilna Gaon”. In the days of the Gra (Genius), the Great City Synagogue of Vilna was constructed from stone between the years of 1630 to 1633 after they were granted permission to construct a stone structure to replace the aging Old Synagogue. Three years later, the Stone Synagogue was damaged by a riot of the citizens using rocks to damage the exterior façade, but more catastrophically the interior of the synagogue was destroyed and looted. The Great City Synagogue was then rebuilt in the new Renaissance-Baroque style in the Schulhof (schoolyard that was also called the Synagogual yard). Over the decades, the Great City Synagogue continued to grow into a larger complex that eventually was surrounded to include 109 synagogues, twelve shuls, a community council, houses of prayer including the famed prayer-house of Rabbi Eliyahu ben Solomon Zalman, that was built in 1800. Then there included prayer halls for the artisan’s guilds, a beth-midrash (House of Learning), mikvahs (Jewish ritual immersion baths), a community center, the famous Strashun rabbinical library plus kosher meat stalls. The whole complex became a great Talmud Torah study center and the heart of the movement of the Mitnaggedim. The synagogue was partly destroyed by the Germans during World War II. After the war the synagogue and the whole schulhof complex were destroyed by the Soviet authorities and replaced by housing blocks. Today, three original pieces from the Great Synagogue of Vilna survived the destruction quite miraculously. They, a door of the Holy Ark, a reader’s desk (omed), and a bas-relief with the Ten Commandments are now displayed at the Vilna Gaon Jewish Museum. Mattityahu Strashun (1817-1885) was a rabbi and scholar of Vilnius the son of Samuel Strashun, who married into Jewish wealth and was financially independent the rest of his life. In the 1840s, Strashun revealed to the Jewish community in Lithuania that he was a Maskil and a supporter of the Haskalah, the Jewish Enlightenment movement whose underlying goals would eventually seek to destroy Rabbinic Judaism. In 1841, when a group of educated Jews led by Nisan Rosenthal established two Haskalah-inspired schools in Vilnius, where children studied both secular and religious subjects, Strashun was a teacher at one of the schools. During this era, he became acquainted with Max Lilienthal, a representative of the Russian ministry of education whose project was sponsoring the government-sponsored secular and religious education. This came on the heels two centuries after the impact of the equally devastating rise of the false messiah, Rabbi Shabbatai Zevi and his prophet, Nathan of Gaza who turned the concept of Jewish messianism upside down. They influenced hundreds of thousands of Eastern European Ashkenazi Jews with the false premise that when the messiah is revealed, that which the Torah proclaimed to be truth would become false and that which the Torah proclaimed to be false would, under the new messiah, become truth. One of Mattityahu Strashun’s passions was collecting Jewish books, magazines and literature. This became the Strashun Library of rabbinical and other works that is often spoken of as the largest library of Jewish learning in the world. His gift of this library became an important landmark in Vilna. Later when the Nazi’s took control of the Lithuanian capital of Vilnius, the Synagogue was looted and destroyed in 1941. After the war in 1945, the books were recovered, part of it hidden under a Catholic church in Vilna. It became known as the Strashun Collection Library where 20,000 volumes later went to YIVO (Yiddish Scientific Institute and the Hebrew University. By the year of 2020 all the library will be digitalized. Before World War II, there were 109 synagogues in Vilnius. Today, there remains only one; the Choral Synagogue Taharat Hakodesh, built in 1903. On one of our multiple visits, we were fortunate to witness the rabbi blowing the shofar in the days leading up to Rosh Hashanah, the Jewish New Year celebrations. Rabbi Chaim Burstein is the Chief Rabbi of Vilna and Lithuania and tells us of the challenges of leading a rapidly fading community. The Tolerance Centre of the Vilna Gaon Jewish State Museum houses relics and art from Lithuania’s Jewish past, was previously a Jewish theatre. It was in the year of 1941 that the Lithuanian capital of Vilnius, was all but destroyed by the Nazis during World War II. According to YNet News, it was reported that the German Nazis overwhelmed the defense forces of the capital of Vilnius, burned the synagogue to the ground and killed most of the Jewish people in the city. At that time, over 200,000 Jews were living in Lithuania, and by the end of World War II 95% of the Jewish population had been exterminated. Today, Vilnius is classified as a Gamma global city which according to the GaWC studies is known for its beautiful and classical architecture and declared a UNESCO World Heritage Site in 1994. There is no doubt that the Jewish influence in Vilnius is what makes it renown in the world which in the 19th century was called the “Jerusalem of Lithuania” and in 1812, was called by Napoleon as he passed through as the “Jerusalem of the North”. In the year of 2009, Vilnius was nominated as the European Capital of Culture, together with the Austrian city of Linz. Slate – “As documented by eyewitness testimony, photographs, and Nazi records, the Christian majority welcomed the Germans as liberators and right-wing paramilitary groups began massacring their Jewish neighbors before German rule had even been firmly established. Over the next three years of German occupation, around 200,000 Jews, more than 95 percent of Lithuania’s Jewish population, were murdered—a more complete destruction than befell any other European country. Lithuanian built Electrical Substation built with Granite Blocks instead of Brick, engraved with Hebrew lettering. So today, seventy years later, and within months of the Year of Jubilee in the Land of Israel, Israeli archeologists will return back in Lithuania, this time with ground-penetrating radar survey on a sight beside and below a school, which they believe to have discovered the remnants of city's dominant Renaissance-Baroque style, Great Synagogue that once was the epicenter of Lithuania's Jewish population. Yet that is not the only story for a more sober and chilling revelation had now been discovered. Giedrius Sakalauskas, a local Lithuanian had driven along this route many times and was always fascinated by the bunker style building located in a wooden region outside the city limits of Vilnius, Lithuania. It was well known that this was an electrical substation, but it was strange that it did not have the usual brick exterior building, but instead was built with granite blocks. A team of archeologists came to investigate the building and truly it was an electrical substation but it was built with tombstones that were stolen from a nearby Jewish cemetery that was once across the street. The cemetery was destroyed fifty five years ago which this part of Lithuania was occupied as part of the Soviet Union. Sakalauskas had a strong hunch about where they came from, and he was correct for the archaeologists confirmed that the electrical substation was built with tombstones pilfered from a Jewish cemetery. He believed that the origins of the tombstones came from a Jewish cemetery that once sat across the street. 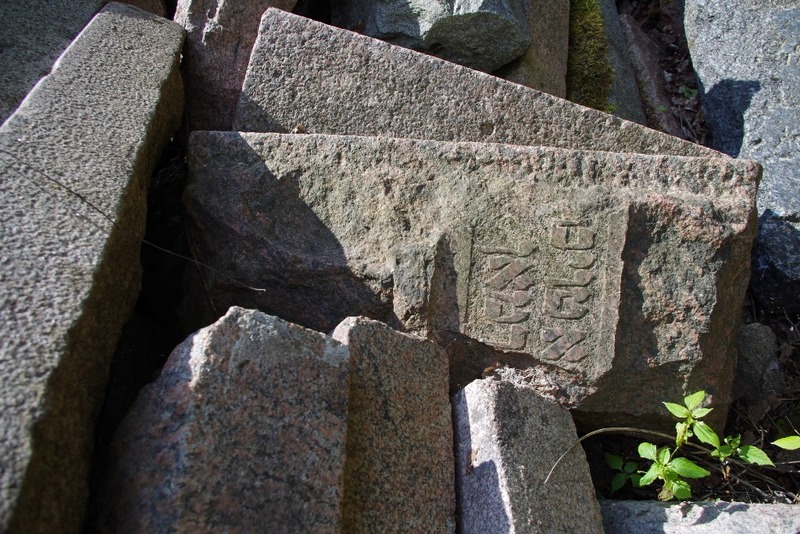 The tombstones were stolen from this Jewish cemetery until the cemetery was demolished in the 1960s, forty five years ago when this part of Lithuania was occupied as part of the Soviet Union. While much has been said about the Jewish survivors of the Nazi holocaust, life did not get better for the Lithuanian Jews when the Nazi horrors faded with the end of World War II. A new reign of terror began with the Soviets when they took control of the region in the year of 1944. Jewish life was virtually extinguished, and without the presence of the Jews, the Jewish cemeteries, according to one Vilnius University historian, were discovered to be “easily accessible and free building material” during the subsequent and ruthless Soviet era. Julius Norwilla – “In the fifties and sixties, the Soviets liquidated the historical Jewish cemeteries of Vílne, as the city is called in Yiddish, and bulldozers pushed the matséyves away to make the space for new city development. Instead of importing new stone for various municipal construction works, local authorities preferred to scratch out or place facing away from view the layer carrying burial inscriptions, yielding these excellent “free” building stones.With the declaration of our national independence in 1990 and over the early years of state building, the public cases of desecration of matséyves were rightly condemned as culturally barbaric. In 1992, the (in) famous steps to the Soviet Labor Palace, all pilfered matséyves, were duly removed. It seems they landed here on the grounds of the nursery. But it seems there was no plan of what to do with them, and almost a quarter century later they are lying in a weird heap eerily viewable by those who covet a bush for their garden or an exotic plant for their apartment. The Lietuvos rytas report informs readers that the municipality is about to move the stones from there, but without details of where or to what purpose. Well, here’s a suggestion based on the idea that philosophical and theological reflection can help provide ready solutions to reversing and making good past profanation. Jurgita Verbickiene – “More than 90 per cent of the pre-war Jewish population of 240,000 were killed during the 1941-44 Nazi occupation, some of them by Lithuanians. With Jewish life all but eradicated from Vilnius, Jewish cemeteries were seen as “easily accessible and free building mat­erial”… Ethnic and religious groups were repressed along with dissidents in Moscow’s efforts to unite its communist empire. Which brings us back to the 18th century era of the Vilna Gaon, called the Gra in Vilnius, Lithuania. He was a legend in Jewish history. The Vilna Gaon understood that according to the prophecy of the Zohar, that the history of the final redemption would begin to accelerated the intensity of its pace as time raced towards the 6000th year since the creation of Adam. This would be the end of the 5,000 year era of man. Rabbi Hillel Rivlin, the Vilna Gaon’s leading student when writing the first chapter of Kol Ha Tor, he made this observation of his Master, the Gaon of Vilna. Kol Ha Tor – “Many times I saw our master pacing back and forth in his study, addressing [HaShem] in an awesome stormy spirit, “Master of the Universe, don’t You have a middle path between be’itah [in its due time) and achishenah (I will accelerate it)? The Gra had already tried twice to go to the Land of Israel with his disciples but was not able to realize his dream of accelerating the redemption of the Land of Israel. Now the “Gra” was old and died in the year of 1797, twenty one years after the American Masonic Revolution in 1776. According to the Chazal (Rabbinic sages of past eras), World War I and II were parts of the “End of Days” era as the prophetic Gog-Magog War before the Era of the Messiah will begin. As such, in the 20th century, the Great Wars were major catastrophic eras that took the lives of over 100 million people around the world. Yet this is not including America’s Revolutionary War, War of 1812, Mexican War, America’s Civil War, Korea, Viet Nam, Iraq, and Afghanistan. 17 million people would die in World War 1 (1914-1918) which consumed Europe first plus an estimated 60 – 85 million people would die in World War 2 (1939-1945) which involved the entire world. It raised the spectrum of the bloodiest century in history as Planet Earth that was devastated by two great global and international wars. The potential of “jump-starting” redemption at one time was not going to happen for the Children of Israel; the Jews of the House of Judah and the Lost Ten Tribes of the House of Israel were already considered “not worthy” and as such we forfeited redemption by “pure achishenah” (I will accelerate it”). The numbers of Civil War dead were not equaled by the combined toll of other American conflicts until the War in Vietnam. Some believe the number is as high as 850,000. The Civil War Trust does not agree with this claim. As history will attest, in the era of the colonization of America with the 13 Original Colonies that represented 13 Tribes of Lost Israel (Including Joseph’s second son, Manasseh) the era of redemption by “be’itah stage of history would did not come and therefore it would have to come (“in its due time” with great suffering and calamities). This one statement should sink in with great soberness. Since that day, the American Revolution would establish the Republic of the United States. It would be followed by an American Civil War that that would devastate the Southern States over the slavery of Black Americans. And yet, as we face the Jewish year of 5776 with the arrival of the Year of Jubilee and the potential of witnessing the inauguration of the “Messianic Era” of King Messiah in 5777, are we as the Lost Sheep of the House of Israel prepared to rise up and beg the G-d of Israel with emuna (faith in the Sovereignty of G-d) and teshuva (repentance) to prepare us for the final redemption of Klal Yisrael (All Israel)? Do we have to wait another Jubilee (fifty years)? What about two Jubilees (one hundred years)? Or what about three Jubilees (one hundred fifty years) or four Jubilees (two hundred years). With the economic world in the wake of the default of the Nation of Greece, the mother of democracy, now sending all the stock markets around the world in a tailspin, we can perceive that the forces of darkness are in bitter conflict with the forces of light for dominion of Planet Earth. As we fear the collapse of the Nation of Israel, the reality is that Israel prospers as the nations that are surrounding her are collapsing. Biblical King David's Kingdom at the time of his death. This map is probably close to the Expansion of the future Greater Israel. Are we willing to prepare our lives to become a participant in the It’chalta d’Geulah (ingathering of the exiles) which include the resettling of the Land of Israel? Are we willing to join hands with the Jewish patriots and pioneers who are putting into fulfillment the settlements of Shomron and Judea, called the “West Bank”? Are we willing to begin changing our lives in preparation for the beginning of the on-the-ground preparation for the revealing of King Messiah, Metat Sar Hapanim (Angel Prince of the Face) called Metatron as Greater Israel comes into its full reality as it spreads from the Nile of Egypt to the banks of the Euphrates River; the full extent of King David and Solomon’s Greater Israel? If you have wondered how biblical prophecy fits into your life, and how it will effect the Return of the House of Israel, then the G-d of Israel is beginning his “call” to bring you home, too. You might desire to reconnect with your cousins the Jews and the Biblical portrayals on what is and may be happening in your near future.